The Monterey Bay area is home to many talented chefs, and they love to show off their artichoke cooking culinary skills. We’re planning another great line-up for the 2019 Festival. EJ, of Rancho Cielo, attended the California School of Culinary Arts, Le Cordon Bleu Program. He has served as Executive Sous Chef for Ventana Inn and Spa in Big Sur and Chef de Cuisine at The Monterey Bay Aquarium. Butch of Cowboy Sausage and Chili Company, makes chili and sausages on his own terms. Cowboy Sausage is a favorite at local farmers markets, and some have taken to calling Butch “the sausage king of Salinas.” In fact, Butch Francis’ sense of humor has become a Festival demo favorite. Don’t miss your chance to experience it for yourself. Creator of Chef’s Palette Spice Rubs, Chef Dyon brings his unique palette for big flavor to The Artichoke Food & Wine Festival demo stage. His signature spice rub blends add a depth of flavor that Chef Dyon (pronounced like dyin’!) found missing in what he could find on the market. Ingenuity, persistence, and a chef’s palette, fuels his passion for flavor in his signature creations. Don’t miss a chance to learn from this flavor master! Pat, Manager of the Artichoke Advisory Board, knows Artichokes like no other. Hailing from the anthracite coal mines of Pennsylvania, Pat found her way to the artichoke fields of Castroville as a military spouse. 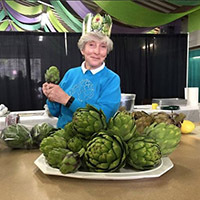 Today, her annual ABC’s of Artichokes presentation at The Festival unveils the mystery and flavor of California’s official state vegetable! As the new Executive Chef, Blackerby brings a ton of experience and expertise to the Central Coast. Prior to coming to Monterey, Blackerby had two stints as executive chef at Mission Point Resort on Mackinac Island, Michigan; executive chef and food and beverage director at The Ellis Hotel in Atlanta; chef manager at Remote Logistics International in Doha, Qatar; executive chef at Hotel ZaZA in Dallas, Texas; hotel manager and food and beverage director on the American Orient Express; and executive chef stints at Hotel Mondaco in Salt Lake City, Utah, Hotel Edgewater in Seattle and at Nana’s Grill at the Wyndham Anatole Hotel in Dallas. The renowned Hyatt Carmel Highlands, which overlooks the Big Sur Coast and features 48 luxuriously renovated guestrooms, has announced the hiring of Christopher Vacca as its new Executive Chef. Chef Christopher has extensive experience in the restaurant industry, as culinary consultant, in menu development, owner and executive chef, in a variety of settings, from fine dining and fast-casual to catering and food trucks. He is an alumni of The Culinary Institute of America, recently served as the executive chef at award-winning Cantinetta Luca in Carmel and executive chef at Big Sur Bakery in Big Sur, part of a diverse 20-year career in food and wine. Chef Vacca’s specialties include charcuterie, “everything Italian,” kitchen design, menu development, knowledge of wine and specialty foods, and being an expert pizzaiolo on a coal or wood-burning oven.